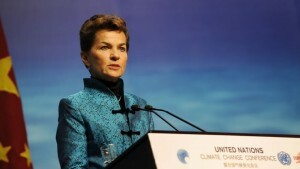 The Unit­ed Nation’s top cli­mate change offi­cial Chris­tiana Figueres announced this week that the group is active­ly work­ing to “inten­tion­al­ly trans­form” the world’s eco­nom­ic devel­op­ment mod­el, a task she called the “most dif­fi­cult” one the group has ever under­tak­en. “This is prob­a­bly the most dif­fi­cult task we have ever giv­en our­selves, which is to inten­tion­al­ly trans­form the eco­nom­ic devel­op­ment mod­el, for the first time in human his­to­ry,” UNFCCC Exec­u­tive Sec­re­tary Figueres stat­ed at a press con­fer­ence in Brus­sels Tues­day. In addi­tion to the treaty, there are the cur­rent Cli­mate Change actions from now and until 2020, the financ­ing pack­ages and the so-called Intend­ed Nation­al Deter­mined Con­tri­bu­tions (IND­Cs). These are the actions that coun­tries intend to take under a glob­al agree­ment from 2020 and have to be pub­licly out­lined before the start of the con­fer­ence. It is expect­ed that all major economies will deliv­er their plans in time: the US, Chi­na, and the Euro­pean Union have already shown their cards.